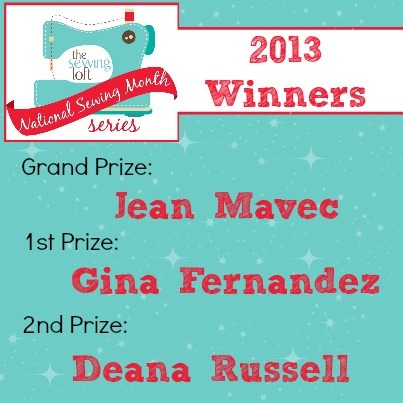 National Sewing Month 2013 Giveaway Time! National Sewing Month 2013 is almost over and we have learned about some amazing tools. From the Q-Snap frame to the Kwik Klip, we have been schooled!! But in all fairness, I still want to give you more to help keep those creative juices moving in the right direction. So, how about that giveaway? That’s right, with the help of our amazing sponsors, The Sewing Loft is excited to kick off this giveaway in style! These prize packages, courtesy of some of the industries leading brands, are jam-packed with fantastic goodies that will make even the seasoned sewist drool! 3 lucky winners will take home a stash to be envied. So, whether you’re a newbie just picking up the craft or a seasoned stitcher tackling monster projects, these prize packages will make a wonderful addition to your sewing stash. Click the giveaway image below to enter the National Sewing Month 2013 Giveaway for your chance to win one of three HUGE prize packs. The total of all prizes is valued at more than $2,200! And for those of you just joining us now, you will want to head back and check out each weeks line up. Not only do the guests share some out of the box tools but the projects are really cool! There have been several tools that I If you’re just now joining in, be sure to stop by to check out Week 1, Week 2 and Week 3 of the series. We have had some amazing guest share their favorite tools that you do not want to miss. Remember, this series was designed to expose stitchers of all levels to new tools in the work space. I want you to feel inspired to step away from the standard sewing machine and try something different in your workroom. Who knows, you may just discover a new tool that you can not live without, I know I did! No purchase is necessary. This promotion is in no way sponsored, endorsed or administered by, or associated with, Google Docs. We hereby release Google Docs of any liability. No purchase necessary. For alternate entry, e-mail info(at)thesewingloft(dot)com with your full name and the subject line “The Sewing Loft National Sewing Month 2013”. Prizes will ship directly from the sponsor within 7 business days of the end of the giveaway. Giveaway starts Sunday, September 22, 2013 at 8:00 pm EST and ends Sunday, September 29, 2013 at 11:59 pm EST. Once the giveaway ends, winners will be chosen using Random.org and contacted within 24 hours by e-mail. A post announcing the winners will go live at https://www.facebook.com/TheSewingLoftFB with winners’ names on Monday, September 30th. Winners will need to respond within 48 hours to claim their prize package or another winner will be chosen. This giveaway is open to US contestants only. If so, I’m glad you stopped by and hope that something has inspired you to keep your needle moving! Don’t miss a single project and subscribe via email HERE! Bonus- free embroidery pattern with newsletter sign up. Wow! What great prizes! Some lucky people are gonna be real happy! I would be the happiest girl in the world for sure! We are all so fortunate to have such great supportive people for our hobby of quilting and sewing! Thank you all! Teachers, sponsors, ect. You all rock!!!! Very nice line of goods. I would be utterly ecstatic if I won any of these prize packages!!!!!!!! Ooo nice prizes! Thanks for the chance! THANKS TO THE SPONSORS+TEACHERS+BLOGGERS WHO INSPIRE! Thanks for a great giveaway! Thanks for the contest! Love the prize packages! Hope I win something. What fabulous prizes. Thanks for this great giveaway to all of the sponsors. Like to visit your site. Thanks for the chance to win!! Would love o win this one. Wow, love the site and prize giveaways. Thanks for the chance to win! Would love to be one of the lucky winners! What a great opportunity! Thank you for the chance to win! This is a wonderful give away. I would be thrilled to be one of the winners. This is a wonderful series! 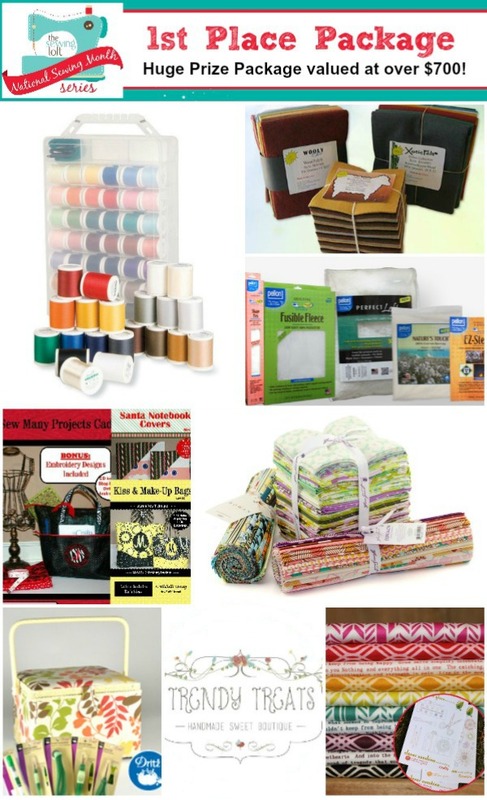 I enjoy The Sewing Loft and have found some other great blogs with great ideas! What a wonderful prize package…..this is as good as winning the lottery!!! I would love love to have this. Thank you for the chance. What a great giveaway! Any of these prizes would put a big smile on my face! like the bobbin organizer, I keep it handy. Best tip I ever had was to wind up more than one bobbin when you are going to do a project so you don’t have to stop and wind another bobbin. I would love to win. Thank you so much for this chance. Great site. Would love to win one of those great prizes. I would LOVE to win a prize pack! I’m new to sewing and this would help me to learn and expand my abilities! Thanks for the FANTASTIC giveaway!!!! What an awesome opportunity for those of us who are going to be making Christmas presents. Thanks for the chance to win. Amazing prize package Heather – thank you so much for offering this great giveaway! I am super hopeful! My sewing machine gets a lot of use! 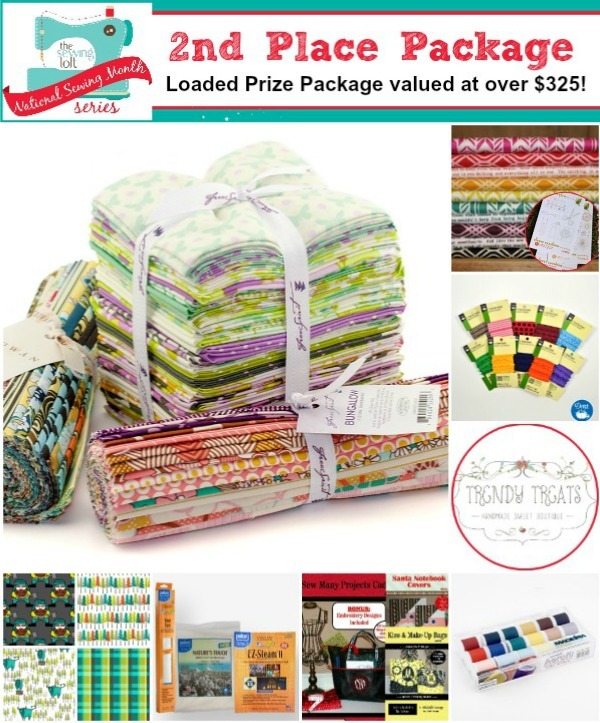 Wow such great prizes….I would sew love to win. Great prizes, what an awesome opportunity!! This would make my year! What a give-away. I have enjoyed each week and hope I win, but I’m not too optimistic because I never win. Thanks for sharing such great tips and information. I’m totally blown away by the fantastic prizes! Thanks for the chance to at least dream of winning! It is a wonderful contest and very exciting to have all the goodies come to your door…like Christmas for days!!! This is so neat, thank you! So exited for all the lucky people that will win. Everything looks awesome. You are all very generous. Good luck you guys. Super give-a-way! If I win I would gift it to my 9 year old granddaughter. She loves to sew and has been sewing for a little over a year. she uses my machine now when she wants to sew, which leaves me without a machine until she finishes her project. These prizes are above and beyond. I would be so happy to win anything! great giveaway! love sewing and sewing tools and gadgets! How exciting! I love to sew, crochet, crafts. Good luck everyone! This is a huge giveaway! I will be crossing my fingers and toes hoping its me! This is a great give away. I would be very excited and happy to win any of these prizes!!! What a give-away. Thanks for the offer, that would be so nice to win. Thanks for the opportunity to win this great giveaway!!!!!!!!!!!! You made my day!! Thank you so much for sharing your thoughts and I am so glad that you are enjoying the series! thank you for the chance to win such wonderful prizes! just click the photo at the bottom that says “Giveaway Time Enter Here”. It will ask you for your email address and you are entered! A sewing dream is what this is. Wow!! What a great awesome package – thank you so much Heather for offering this great giveaway! I wouldlove to win it!! Would do HappyDance if I won any of the wonderful prizes! Wow. Enter me, please. Good Luck everyone. This is a fantastic contest!!! I will be waiting anxiously for the post about the winners. 🙂 Absolutely fanatic about the website! So cool! Thanks for offering this great giveaway! I would love to win any of these products! Thanks for the chance. I would love to win – thanks for the chance to enter! I would love to win since I live hour and half from a quilting store. And thanks for the chance to enter to win such wonderful gifts. Never have enough sewing stuff! Thanks! Wow, what a nice addition this would make to my sewing area! I bought a Babylock last year and love it! Would love to win this for my daughter, who wants to learn how to sew. Thank you. Enter me please, such wonderful time to be had. Would love to win as I love to sew! Have been sewing for over 55 yers. great prizes, I would love to win. I wish I’d win some of these prizes! What a great contest. I would love to win! I would love a new machine,and then I could pass my other brother to my daughter! Thanks for the give away! I would love to win any of these prizes! What awesome prizes! Thanks for the opportunity! Wonderful gifts, may God direct these gifts to the people who would get the most out of them. Hope I am one of the winners. Any of these prizes would make life much easier in my new sewing room. I have been using a corner of my table area for my sewing room in an apartment, but I am about to move to a new house with an entire room for my sewing. Any prizes are greatly appreciated. Great prizes!! I just got my dream machine last Christmas & I adore it! If I win this wonderful giveaway, I have a good friend in need of a new machine & it would make her especially happy! She’s given me so much beautiful fabric & got me started quilting. I’d love to be able to do this for her. I can’t quilt by hand because of my arthritis, but, it would be a blessing to have a machine to do the quilting on. would love to have any of these wonderful prizes!!! Pick me. great giveaway…would love to win! Awesome prizes!! Winners are going to be very lucky to get all that awesome stuff!! Retired in June so I could have more time for quilting – this would be such a sweet prize to win!!! Yowzers! Someone is going to be super happy with all this! Great prizes. Thank you for the opportunity. Great prizes! I would love any of them! This is awesome give away!! Good luck to every one!!! Great site! Glad I discovered it! Wow, I would love to win a Babylock and all the goodies! 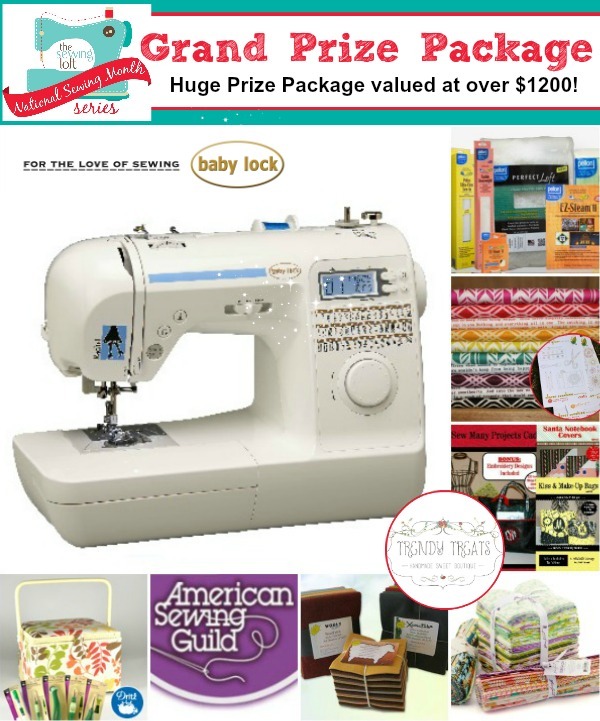 I would love to win a new sewing machine, or any of these great prize packages! What great give a ways. Thank you. What an amazing giveaway, would LOVE to win! All the prizes are fabulous! Any of them would make a sewing gal very happy! Awesome prizes and sewing tips. Thanks! What a great prize package and nice craft items. What fun to start a new project with these fine tools & supplies! This giveaway will be perfect for my sewing room dream! My prayer is to win this to give my Mother a great gift for her November Birthday! I would sew love to win your giveway!! I have many projects planned for christmas and these would sew help me with them. Thank you…I quilt till I wilt…. Thank you for offering a chance to see what you have available and to take a chance in winning. This is truly a great giveaway. I’ve reposted the link to your blog from my blog: https://quiltorchard.blogsport.com. Happy crafting, sewing and quilting to all! Wow! What a great Prize. I would love to win .. I am starting my own Sewing business.. It would help a lot.. Good Luck everyone. I love the way you encourage people to spread their wings and try new things! Hi, I love to stop and check out what is going on. I love all the tools you find and the ideas. I would love to win any one of the prizes. What fun prizes! Just in time for the rainy weather where I get to spend more time sewing. WOW! What a great giveaway! Would love to win some of these awesome prizes. I’ve really enjoyed the series about all of the tools I have but did not know how to use! This is a wonderful giveaway! Thank you so much for all of the info you have shared! OOOOOooooooo….I would LOVE to win! I need to employ some new techniques and ideas, and these prizes would be awesome to do just that!! Having fun going thru this site,,,,,lots of encouragement and ideas… keep them coming! Wow! To win any of the prizes would be so awesom! My sister in law is teaching my daughter to sew doll clothes, they do WOW Wednesdays, They have sewn a few shirts and pants and I like a dress and a adorable hat! This is would be so great, then I would me motivitaed to learn how to sew! My daughter can sew and I cant” What is wrong with this picture??? I thank you for such a great giveaway! I’d love to win and share. magnificent sponsors! They are generous to those who support their products. Great give away. I will be bless if I win this price.. Thank you for a wonderful giveaway! Lots of treasures for the winners! I wish it could be me. 🙂 for real. wow, what a giveaway. thank you so much for a chance to win. What a fabulous prize package. Oh to be so lucky! Great prizes I will be so excited when I win. I would be so bless if i win Thank you ! Winning is a privelege that only few will know. I hope I am the winner so that I can really sew!!! SEW Exciting for the chance to win!! love the blog! Oh, wow! I would LOVE to win any one of these wonderful prizes!!! Wow…what perfect timing for this giveaway. My Mom’s Singer 500 from the 60’s has finally died. It’s on it’s way to the shop and I pray they can fix it. Would love to win a new machine! All the prizes are wonderful. Thank you for this opportunity. New to this site and to sewing but, thanks for the opportunity for these giveaways!! What a wonderful machine to take to my sewing classes and a variety of selected prizes. Thanks for a fantastic giveway!! I love your site, every inch of it :D…it will certainly be a Blessing for whoever wins! It would be fantastic to win such great prizes! Great prizes! Would love to win any of them! Oh my wouldn’t it be wonderful to win. Thank you so much…. I love watching your Videos, especially since I no longer have TV and can’t see your show .You are such an inspiration to me and I have learned so much from your show, your videos and your books . Thank you so much for making me a better sewist. I don’t think of sewing and quilting as hobby. I think of them as a way of life. I teach young girls from age 7 thru 12 the basics and watch them go and grow! The creativity that comes out of these sweet girls is amazing. They are learning also that this is not just a hobby but a way of living and using what we make and enjoying what we make and sharing what we make!!! Thank you for the opportunity to win these fantastic prizes. How exciting! Those prizes would be fabulous entertainment. Yay. Fantastic prizes! Keeping my fingers crosse! What an awesome giveaway!!! Would love to win and give to my mother-in-law as a gift. She so deserves it! Fingers crossed. Spectacular & fun giveaway! Thank-you! Good Luck to all of us! Sewing is my favorite hobby and I would love to win. Thank you for the contest. Great program. Fun to learn about the new tools out there. Thanks to everyone for sharing. I enjoy all of your programs and sewing tips. Of course I would lIke to win too. It would be great fun to win one of these prizes. I need more tools to share with my granddaughters. Would love to win I sew for my grandkids and my family and friends. Thanks for the great giveaway. First visit to your site and have signed up for newsletter. THANKS for a great giveaway! Practical prizes too! No, I am sorry. Only one entry per person. I love your give aways!! I could make some really cute gifts for family!! My Bernina is acting up and I would love a new sewing machine!!! Keeping my fingers crossed you pick me!! My sewing machine died a year ago and I can’t afford to buy another one. Would be a dream come true to win this one! Would definitely get enjoyment out of this give away. Thanks! Wow, such generous prizes for three winners! Good luck everyone! Thanks for the give away! Thank you for the chance to win and also for a great sewing site. I can’t even imagine winning just a portion of the prizes. How fun it would be. Looks like last years winners have really enjoyed their prizes. Would be a dream to win any of the prizes! Oh the quilts and clothes I could make and the sewing machine would be great to make them on. I would love any of these items!. Learn so much here! I usually make gifts for friends and family!!! It would be so great to win!!!!! I would be very bless and happy if I would be one of the winner. I’ve been making lot of free dresses for the lady in the church.